Is there anyway to show the description when you analyze them in battle? Still waiting on feedback regarding the test project I uploaded. You might want to add scrolling between levels/difficulties. I'll try to get to look at it today or tomorrow. Since I haven't been getting much help with this I've decided to remove this script from my game. I will, by extension, remove the three script calls using it (two in the test room and one in a library) and dummy out the "Scan" skill that would've analysed monsters. I'm not doing it tonight, I'll do it when I get around to it. EDIT: Dummied the script out (it's there but inaccessible) and the skill. Also made a new test project and uploaded two versions, with and without Doppelganger. I haven't tested them yet but I doubt anything will be different. OK, well normally there is a class method which returns the class of an object in Ruby. Borrowing from the way the default scripts setup actors, Yanfly overwrites the class method of Game_Enemy to instead return the RPG::Class object of a monster, which would be nil for a regular monster and the actor's class for a doppleganger. This was a problem because I was using monster.class instead of simply Game_Enemy to account for the possibility that another script could make enemies of a different (RGSS3) class. # below the Monster Catalogue script. Sorry that I took such a long time to look into it. I was really uninterested in RM for the past few months and only just recently decided to return to it. I've tried going through to see if there was a typo anywhere within the few lines surrounding this one, or if there was a missing ) after a line but I couldn't find anything. I tried commenting the line out but then the error just continues to move downwards. I copied the script directly from your Pastebin link. If you could help it would be much appreciated. I am not receiving that error, sorry. Also, that's not line 1076 in the pastebin script. Are you sure you correctly copied the script off pastebin? Try downloading it off pastebin and then select all in the txt file that is produced. If that doesn't work, I will need you to share a demo with the error since I cannot reproduce the error. Aha! Of course it would end up being something as simple as clicking the pasteboard icon to copy it. I just copied it straight from the doc at the bottom of the page before. Now I feel stupid, but thanks for pointing out the obvious! This script does almost exactly what I want, with one small detail missing: would it be possible to show the 'rates' (Element Rate, Debuff Rate, State Rate, State Resist) if the enemy has any? Perhaps in a second screen that you get by pressing the action button a second time? Awesome script. A few issues and questions, though. I use this script ONLY for the \analyze aspect of using a skill or item to scan an enemy. The only error I've come across is when changing what stats are shown. In my project, the Luck stat represents the Level of the enemy, so when I changed "Vocab.param(7)", to "Level", the script would crash citing an uninitialized constant. Not a big deal, I just made it so the Level (Luck) wasn't shown. But if there could be a fix for that, it'd be awesome. Is there a way to completely remove the border around the text in the window when using an analyze skill. The information is already contained within a window, so it looks kind of weird to me. For species, I think it should be possible to add more than one species to an enemy, for when you have enemies that are, let's say, made of fire and can fly. Letting the player know to use weapons or skills that have increased effectiveness against flying enemies, etc. Currently, the script only displays one species for an enemy. That's all for now. Great work on this script! Alternately, you could have just changed the term for Luck in the database. As for multiple species, you are right that would be a good feature to add and it wouldn't be overly difficult to do, but I don't intend to return to this script at this time. I don't have much time for RM these days, and I have several prior commitments. 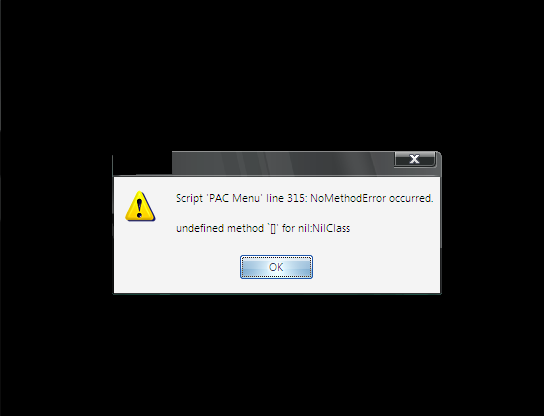 How can I add this to the PAC Main Menu Ace script? When I use this script with Pacman's it gives me an error. It would be nice if I could add the monster catalogue to his menu. PS: I'm also using Pacman's Menu Compact Display Addon. If you can show him what the error message is or looks like, he may be able to give you a little more help bud. Can you show me your setup for the main menu? Also I was definitely about to say what Modern Algebra says in the next post. I think the problem is with the way my script automatically inserts commands into the menu. It is intended to bypass any custom scripts and add it directly, but it runs into a problem where your script relies on there being an entry in your COMMANDS array to show an icon. As such, he needs to turn off the automatic adding in my script, but once he does that there is no longer any method to call the scene, since that method relies on it going into an array in my script. # from a command in the menu. If true, then it is. If false, it isn't. You can name it whatever you want and change the icon as well, naturally. Thank you, MA! It works perfectly! But can I do the same thing with your Quest Log? And in Pacman's configuration you would need to use that method name. Otherwise it's the same once you turn off :menu_access in the Quest Journal. Thanks a lot, MA! It works! I want to use your script in my game. When I open the window from menu, everything works. Script 'Monster Catalogue 1.1' line 1354: NoMethodError occured.